It's time to talk #paperhaul again! Similarly to last month I really felt the new sleeker packaging worked well for the box and again loved the how the sticker on the envelope shared a little sneak peek of the month's theme. 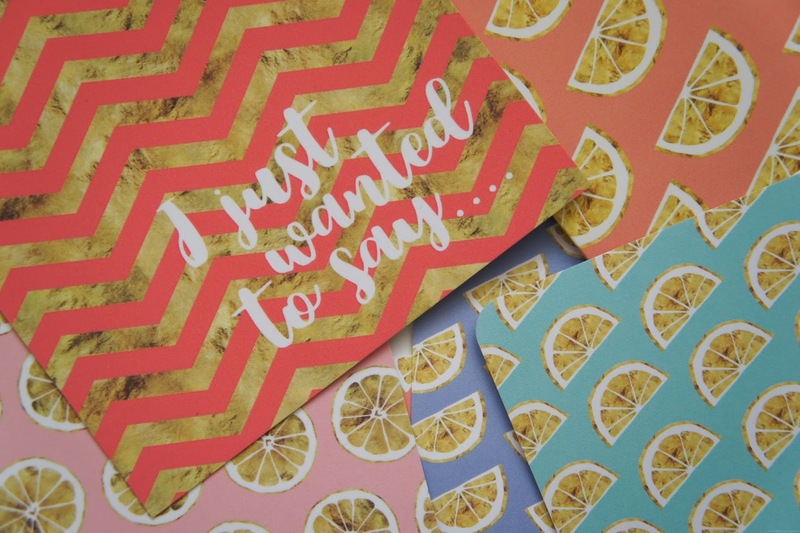 As you can see from the photographs April's box shares the love for lemons with block printed pastel colours and eye-catching repetitive prints. Included this time around were three notecards, three postcards, one large greetings card and a notebook. Although I have quite a few of them at this point having been a #paperhaul subscriber right from the very beginning, I find the little notebooks really handy to have around and was happy to see that April's contains dotted pages (my personal favourite kind!). My favourite items of the bunch would probably have to be the trio of notecards patterned with little lemon wedges and the large greetings card which reads 'when everyone else is being a lemon be a lime'. I also really enjoyed the matching decoration on the reverse of this month's postcards; perfect for sending snail mail to brighten a friend's day.